With personal resources and support from friends, Mr. Zakarias initiated the idea of saving old farm buildings and rebuilding them in a remote Carpathian village near Ghimes (Gyimes) (more) known as home to the Csangos, an ethnic branch of the Szeklers. Though working with limited funds, the buildings are carefully recrafted and maintained as seasonal homes for family, guests and visitors. Both he and Dr. Kovacs are practicing architects with a strong affinity for traditional building vernacular. 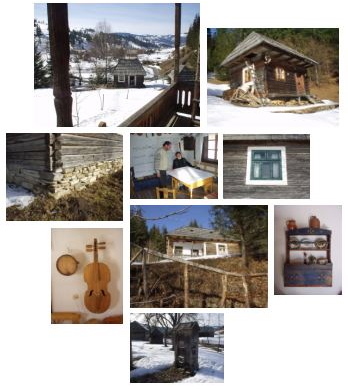 Mr. Zakarias is completing a multi-year effort to document the vanishing vernacular architecture of his predominantly ethnic-HungarianTransylvanian region (see below). Dr. Kovacs is also a faculty member at Ion Mincu School of Architecture (more) in Bucharest and a fellow at the New Europe College (more). SEE: “In the Shadow of Attila,” National Geographic Magazine, June 2005 – feature article on Csangos minority people of Romania. Errors in story and maps are noted by the NGS editor. Click on any photo or drawing for larger view.